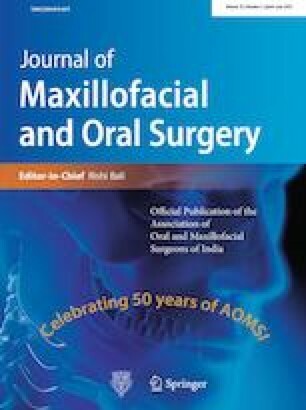 Oral submucous fibrosis (OSMF) is a chronic disease of the oral cavity which presents clinically with burning sensation, leathery consistency of oral mucosa with palpable fibrous bands leading to reduced mouth opening. Though the evaluation of quality of life (QOL) in health care is gaining importance, researches regarding the evaluation of QOL in OSMF individuals are very sparse. The aim of the present study is to evaluate the QOL assessment in OSMF patients through WHOQOL-BREF questionnaire. The study includes a total of 300 participants recruited from the outpatient department. The quality of life was assessed using the WHOQOL-BREF questionnaire. The raw scores for the physical health, psychological health, social relationships and environmental health domains were done on 4–20 scale suggested by the WHOQOL procedural manual. The analysis of variance (ANOVA) was used for the simultaneous comparison of mean scores for the four domains, and independent t test was used for the comparison of two means of domain scores. The participants with OSMF have a significant negative impact on the quality of life when compared with the participants without OSMF (P = 0.002). The environmental factors in the WHOQOL-BREF have shown a significant difference in the QOL of participants with OSMF than without OSMF (P = 0.001). The oral submucous fibrosis has a negative impact on the quality of life in participants with OSMF specifically in social and environmental domains of the WHOQOL-BREF questionnaire.